The perfect pumpkin loaf has the same requirements as banana bread: moist and dense but not leaden. It should have the sort of tender crumb that sticks together when pressed with the tines of a fork. It should be sweet, but not too sweet. This isn’t dessert people! It should taste austere enough to qualify as a good breakfast, but flavorful enough that you’d look forward to saving it for an afternoon pick-me-up. Also, I find that nearly every pumpkin bread recipe is too shy with the spices. Even the ones touted as the ultimate or best. Understandably, you don’t want to completely overpower the pumpkin, which is such a nice earthy fall flavor. But I do think, after much experimentation, that this sort of sturdy quick bread can handle much more spice than most. The point is that the general consensus seems to be one of restraint when it comes to spices. And I’m here to tell you that you can throw restraint out the window. Of course, you can always dial it back down if you’re feeling timid about the whole affair (the words pansy and milquetoast do, however, come to mind then. Okay, okay, I just wanted to use both those words at least once today, you’re not a pansy I promise). Now the original template for this recipe, which I then tweaked to my own liking, comes to me by way of allrecipes.com—but I was directed there by this excellent blogger (The Pancake Princess) who has made a fun practice of picking a single recipe and baking the most discussed versions of it to compare and crown a winner. Her experiments are so fun to read, and it’s so nice to have someone have done the heavy lifting to tell you which popular recipes to bother with and which aren’t so good after all. 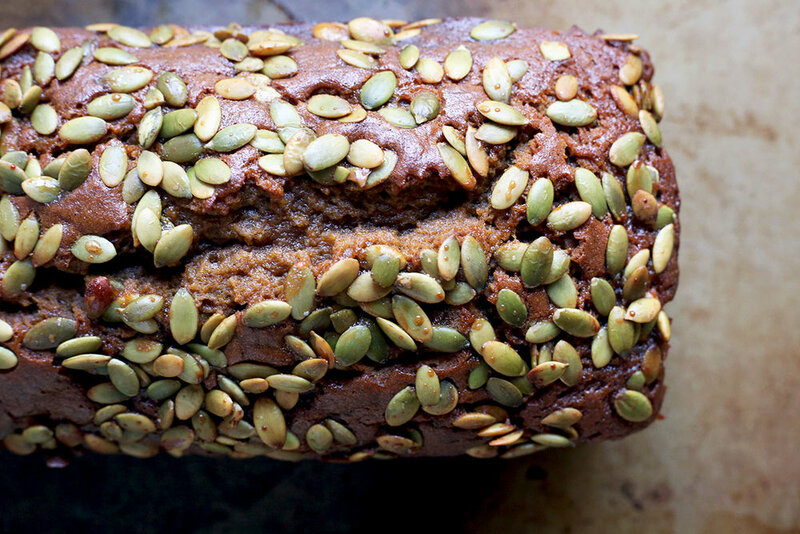 So here you have it: the perfect pumpkin loaf, heavily spiced and topped with a sprinkling of salted honeyed pumpkin seeds. If you need further encouragement to make this recipe, I should tell you that I don’t think I’ve ever seen baked goods disappear so quickly. Each time I’ve shared a loaf of this bread, it’s gone in a flash, and the reviews are glowing. Preheat the oven to 350 degrees F. Grease (or line with parchment and grease) two 9” x 5” loaf pans (you can also use 8 1/2” x 4 1/2” pan). Mix together all the wet ingredients in a large bowl. In a separate bowl whisk together the dry ingredients. Gently fold the dry ingredients into the wet ingredients until combined but don’t overmix. Divide the batter between the two pans and sprinkle with the pumpkin seeds. Bake for 50-60 minutes, or until a tester inserted into the center comes out clean.